When it comes to the security of your house, you do not want to settle for anything but the best. QuickPro Locksmith is the ideal choice for residents in Atlanta region. Our technicians are certified, ensured, and always reliable. Our emergency service force is available 24/7 so we’re here for you when you need it and where you need it most. For residential lockouts, we guarantee that our technicians will come immediately so that you don’t have to wait on us. Our professionals always bring a variety of tools, meaning that every job can be done quickly and on-the-go. Whether you are moving into a new home and require all of the locks to be rekeyed, your mailbox needs a new lock, or you just need a few spares keys, QuickPro Locksmith will always provide the ultimate locksmith solution. Here is a full list of services available to residents of Atlanta: QuickPro Locksmith is proud to announce that we are now serving locksmith Stone Mountain, GA area too. New Locks Installation – changing out the locks in a home can take a long time if you are doing it yourself. QuickPro Locksmith will come to you and install new locks on all of your doors. Our professionals will make sure that your house is secure and that you have enough keys for the whole family. High Security Locks – for individuals who want advanced locking systems in their home, we can help. There are a wide variety of high-security lock options that you can choose. From password protected to user responsive systems, our locks are durable and will keep you and your family safe. Rekey/ Master Key – maybe all of the locks in your home use different keys and this no longer works for you. Our professionals can come in and rekey all of your doors so that only one key is required to lock and unlock every entrance to your home. Particularly popular for doors inside the home, we provide Master Key services as well. 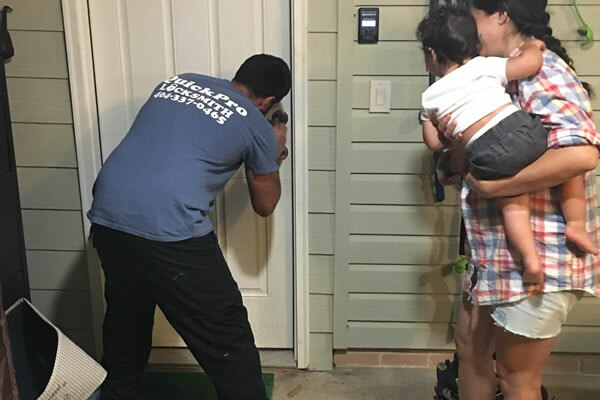 Eviction Service – for landlord’s concerned with a tenant’s cooperation during an eviction, QuickPro Locksmith ensures that the process goes the best that it can. Garage Door Locks – from standard key locks to transponder-integrated systems, we have all of the tools to make your garage as secured and functional as you’d like. QuickPro Locksmith offers unparalleled service that is guaranteed to bring you quality results each and every time. We are not a service limited to cutting keys – we strive to take care of all aspects of securing a home. What this means is that we’ve embraced modern technology and offer the most advanced locking systems to protect against intrusion. All of our installations are fast and affordable. So whether you are looking to replace the current locks in your home or you have decided to automate the way your garage opens, contact us and we’ll get it done. Our free quote service is available for anyone to use who has additional questions or wants to make a booking. If you’re in a bind, remember QuickPro Locksmith and we’ll rush to your rescue, wherever you are in Atlanta!